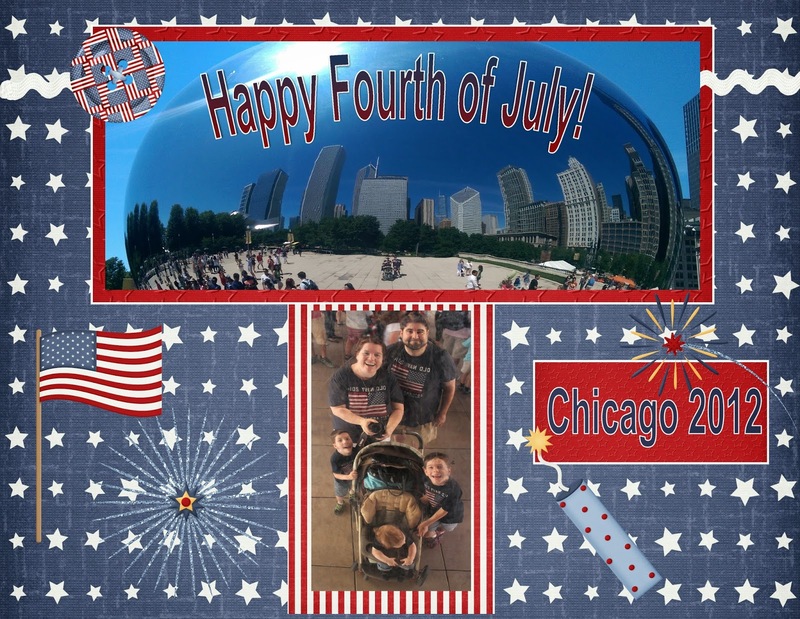 Happy Fourth Of July from the Willman Family! On the Fourth, we knew it was going to be a long day. We decided to go ahead and go downtown, the plan was to drop off our car at the Trump Tower. Take a walk over to Milennium park, see the Bean, play in the fountains (I even grabbed the boys swimsuits, so they could get wet there if they wanted) then walk over to Navy Pier, have dinner, do the ferris wheel maybe, then hoof back up to the Trump Tower for Lacey's dessert and fireworks reception. That was the plan. We debated for a while trying to get back to the hotel for naps, but eventually, we decided that it was going to cost way too much in downtown parking. So instead we just planned on making the most of 12 hours of valet parking at Trump Tower. Of course, plans never go quite as we think they are going to go. In this case, that was ok, we are flexible. ;) Our plans went even better than we thought they would. We arrived downtown at about 11 local time. We had the valet take our car, and he was So Nice! He told us how long it would be, what time (11) after fireworks before they'd up the valet fee. The Trump Tower is the largest free concrete building in the world. For about 10 minutes it was the tallest building. I was surprised at myself. In general, I don't like tall buildings. I'm kind of afraid of heights. But being downtown, I found they were kind of...beautiful. The Trump Tower, with it's location right by the Chicago river, is beautiful. The bridge over the river gave us a lovely view of all the water traffic. There were ferries going up and down the river, and a whole gaggle of kayakers. It made me want to do a river tour..or an architecture tour of the city. Maybe another time. I think we may have to just come back to this town again. We were having a wonderful time. The water in the river, that I remembered being kind of grimy, was really pretty and clean. We really rather enjoyed our walk to Millenium Park. The city noise was something completely from what we are used to. There's lots of stuff to see and look at. Jake was having a great time just people watching. We arrived at the northwest corner of Millenium park, and the boys stopped at a small fountain. I let them throw a couple pennies in and make a wish. They weren't telling their wishes though. They were setting up for Taste of Chicago in the area near the park, and there was some kind of minor festival going on too. And it smelled good. The park was hopping, there were lots of people, sights, and smells. At one point, as we were walking, I thought I heard music. Not the kind of music, like the saxophonist we heard playing on the corner, but an entire orchestra, or wait, maybe it was a choir. As we walked, and explored, we found it was both! There was a choir and orchesta practicing for a concert occurring that very evening. And the rehearsal was open for listening. It was amazing. We just stopped and listened for a bit, before moving on, to find the Bean. The Bean is a sculpture whose formal name is Cloud Gate. At the time of our visit, there was not a cloud in the sky. Somehow this giant steel sculpture manages to reflect the city and the people around it, without showing a single seam in the steel. From a distance, it's very shiny. We could walk underneath the Bean, and the kids enjoyed reaching up and touching it, or laying down and putting their feet at the ends, playing with the reflections. It's an 'interactive' sculpture. They had no idea what kind they were signing up for when they put this into the park, Eric told me, it surpassed their expections. It sure surpassed mine too. It thought the kids would have some fun with it, kind of enjoy looking at themselves. But we all were enjoying it. It's a nifty tourist trap. And I didn't even mind the crowds too much. The area around the bean is surrounded by gardens, it's really lovely. Especially being smack dab in the middle of downtown. I loved being able to capture this Red Admiral butterfly on a rosebush as we walked by. Just after we saw the Bean, Chris had to go to the bathroom, so we found our way around the Pritzker Pavillion and across the Great Lawn. As we reached the top of the lawn, I recognized the music. It was West Side Story. Eric and I couldn't help singing along. The kids didn't recognize it, nor did they care much. But I thought it was a great soundtrack to the day. It kind of seemed appropriate that this night is going to be an extra special holiday for our family. Well, while we were hunting for the bathrooms, Eric's Mom called. She was at a marina with some friends. And they wanted to invite us out for a boat ride. This family had been friends with Mom and Dad since Eric was 4. They met when their eldest boys (Eric) started preschool together at St. A's. Turns out they were living in the same neighborhood, and Mom mentioned carpooling, and Karen's ears perked up. They were two peas in a pod and have been friends for the last 35 years. Apparently, they had a mutual affinity for strawberry daiquiris. They had come to our wedding, and I'd greeted them in passing, but never really got to sit down and get to know them. What a regret! These guys are great, my kind of people. We laughed so hard on that boat ride. They had a light lunch spread set out when we arrived. I was sitting, eating, and watching all the people come and go. All these people with boats, they all have little grills, and bars, and all these teeny boppers in bikinis. You can definitely tell who the cool people are, who the top 1% were. It's an entirely different kind of lifestyle to me. And it was neat. We let Jacob walk around on the boat. We all were watching to make sure he didn't trip and fall into the galley, and the little gate was locked. He thought he was such hot stuff. Honestly, we were so content right there by the docks with a gentle breeze, we could have just stayed there all day. We started cruising out of the docks to do some sightseeing. The boys are required by the Coast Guard to wear lifejackets if they are above deck. And the Grandparent rule was if the boat was moving, they had to have the jackets on. And if that rule was good enough for them, it's good enough for me. Sam enjoyed looking out over the edge while we were cruising. Then the pedal hit the medal. This was just half the giant swath we left in our wake. The water was so pretty. It was a beautiful shade of blue. But there were a lot of other people out too, so there were lots of bumps to hit, waves bouncing. When we were going fast, I could feel the front of the boat lifting up, and I was hanging on to Jacob, who fell fast asleep in his lifevest as soon as we started moving. He hated his vest, so he just slept. The wind made the flag look pretty awesome though. This was a happy place. We slowed down a bit and the boys kind of relaxed their hold, and we could see where we'd been, where we were going, and I had all my sweetboys and a good breeze. Mom and her friend Karen, just like old times, with a glass of something fun. We stopped for gas. If I thought almost 4$ was expensive, boat gas is twice that, and the tanks are Huge! No wonder people say, I have a boat but I can't afford to do anything with it. While we were stopped, the boys decided to go Below and try to watch a movie. Only it didn't work. There's something about being below deck when the boat is out on the water, the waves slapping against it, not being able to see the sky, that is rather disconcerting. They got a little queasy and needed to come up for some fresh air again. People started talking about dramamine, but it takes a while to kick in, and it was kind of too late, and we didn't have kiddie doses. Something to think about next time we go on a boat. Jacob had the right idea. He hated his vest, so he just closed his eyes, and fell asleep. He was so precious. Once we got moving again, we tried to keep it slower. We tootled past the museums where we had hiked all over on Wednesday. I even got this picture of The Adler Planetarium on the right, the Shedd Aquarium on the left, and the Field Museum just up behind it. Very groovy. They had a breakwater rock wall with a cute little lighthouse, to kind of slow people down as they approach downtown, and get near Navy Pier. Although Navy Pier isn't a proper pier at all. It's nifty, and we went around it and parked with a bunch of other boats for a while. But it was too late for the boys. They were properly seasick. Since we were parked, Dennis put his swimsuit on and dove off the back into the lake. I didn't bring my suit, though I had grabbed the boys' so they could play in the Milennium park fountain, which we'd never made it to. I just decided to sit off the back edge and dip my toes in. However, just as I was sitting there, a big wave came along and soaked my whole bottom half. Nice. But cooling off did cure my seasickness. So I worked on the boys. I was trying my peppermint oil, and lathering them up, but they were so hot and tired. It was naptime, and they were queasy, and I think too far gone. I did talk Christopher into putting on his swimsuit and coming out to the back end to dip toes in. He touched his toes to the lake, and thought it was cold. But when Grandma went out on a raft off the back, to sun in her suit, he decided to hop on the raft. He popped back and forth from the raft to the boat, before we told him he was making us nervous, we were afraid the raft would go under the edge of the boat and clip someone's foot or ankle. We pushed him out and made him swim for it. After getting wet once, and swimming to the raft. He decided that swimming in the lake was a lot of fun! Next thing I know he's swimming so far out, the raft rope was out of reach. He looked so tiny, with the lake, the city beyond and big boats surrounding him. I was so proud, and a little nervous. Oh yeah, he took over the raft and was having a great time. But we finally had to drag him back in, and get him dressed. When I was spending 20 minutes to get him into his suit, I didn't think at all that we'd be having to yell at him to get him back in the boat a bit later. I loved that he was having so much fun. As soon as we started moving again, he started to get seasick again. We went slower, so the kids didn't do as badly on the way back in as they had when we were getting gas. Still, they were feeling puny. And they were done. I love that they've been friends for 35ish years. That's something to aspire to. After the boat ride, Mom texted Ryan, and they had the idea to go the Rainforest Cafe for dinner. That sounded good to us, we were game with meeting up with the fam. We saw the crowds at Navy Pier, it was obscene. Apparently, they often have to close the pier and not let anyone else in, it can get so bad on the fourth. So we decided we really didn't need to go there that badly. Dinner at an old haunt sounded great. I remember going there with Kelly and Jason while we were in college, and I bought the tropical soundtrack. I still have it around here somewhere. There was a sign in the shop, saying that they were celebrating their 20th anniversary, they opened in 1994. Aww. that's when Eric and I started dating too. And about the same time we came on a Chicago run when band was done, because Kelly often got a wild hair. I miss her wild hairs. Oh, how she would have loved this adventure we had. I keep thinking of her all through this trip. We had reservations for 6 pm, but we were all pretty tired, so we had Dennis drop us off at 5:30 at Rainforest, and we just cruised the gift shop. Mom and Dad wanted to change, but we weren't changing. We were going to be doing our Fourth Festive Flag shirts for the dessert reception, so we didn't need to change or go to the hotel. They were all staying downtown, and we were the weirdos not staying downtown and not leaving until the fireworks were done. As we were perusing the gift shop, Jacob picked out a toy. He picked out a tree frog. The first time Chris came to Chicago, he got a Beluga whale, so it only seemed fair to get Jake a tree frog, we saw some at the aquarium earlier in the week too. Sam picked out a mood necklace in a tiger shape. And Chris picked out a gorilla toy. They loved playing around in the gift shop. Frankly, I think we chose wisely, since we knew we'd be walking from dinner back to the Trump tower, we were already tired. The less walking, the better for us. When we finally got seated, the kids were so excited to see a Live version of the tree frog that Jake picked out. This is Cha! Cha! the tree frog, the mascot of the Rainforest Cafe. Jake liked him better when he was a little stuffed frog. He didn't like that giant hand, and right after I took this picture, he buried his head in Daddy's shoulder. Yup. Time to take him to Disney, so he can get used to characters in costume! Sam, Kaylee, and Chris loved meeting Cha! Cha! Jeremiah was none too sure. It was a good meal, but it was hard for everybody to hear eachother, so in our party of 12, I didn't get to talk to the other end of the table. That was ok, I got to chat with Lexi (who just turned 13 the day before!) about her party and her boyfriend (gasp! ), so I got the scoop, which was pretty nice too. After dinner, we walked over to the Trump Tower. We were a smidgeon early. But we weren't the only ones, Dad's California cousins had also arrived early, so we got to have some nice chat time with them. The rehearsal dinner was still going on. So we just hung out in the hallway for a while. Jacob loved going wild in the swanky hotel hallway. The place was huge. Finally, they opened the doors, and it was really noisy in the conference room. But the view was sublime. We looked right down the Chicago River to the edge of Navy Pier. Christopher started bugging us to go home after he was done drinking water. He wanted to go back to our hotel in Schaumburg, where we were staying on the first floor, because he said he was afraid of heights. No way man, I wanted to see some Fireworks! Even without the fireworks, we had a beautiful view. So just when I started to think the kids weren't going to make it, that we should hit the road. That's when they doused the lights in our reception room, and the fireworks started. Some even had red hearts, which I thought was dreadfully appropriate for Lacey and Matt. The kids, who had been balking and balking about going home, finally hushed up when the fireworks started. But not Jacob. He was done. So after the grande finale, which was gorgeous, though we had no music, we hit the road. We were out the door, and down in the valet line as quick as we could be. As we waited for the car, the boys waved their flags for the fourth. I had given them flags and glow bracelets. We'd done some temporary tattoos in the morning at the hotel on their wrists. I had poppers, but it was a little too swanky for them. Just as people were beginning to walk past from the pier our car pulled up, we zipped in as fast as we could and headed out. The boys were pretty adorable with their flags, even Jacob. I just wanted to get back to the hotel and lay down. We did. We got out before the crowds got nasty. We were home in 42 minutes or something completely reasonable. And we had the best views. First we got the show at the Trump Tower, with the beautiful fireworks, then from the height of the highway as we drove home, we got to see plenty of other people's firework shows as we drove. It was a sweet ride. And the minute we got into bed, we were all done. Out cold. It was an Awesomely Exhausting Beautiful Independence Day.